What is it with heavy metal bands and a fondness for H.P. Lovecraft and his writings? Athens band Dexter Ward takes their name from a Lovecraft character in The Case Of Charles Dexter Ward. So with their second album, Rendezvous With Destiny, what's there heavy metal sound? 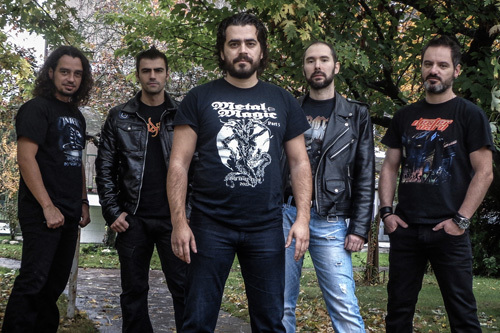 Founders vocalist Mark Dexter and guitarist Manolis Karazeris came from Battleroar, that should give you some clue. Dexter Ward and Rendezvous With Destiny is basically straight up European melodic heavy power metal. There's no guess work as to what goes into their musical presence. Large and harmonious riffage from twin guitars, which always lead to ripping solos. A rhythm section of some power, working that balance between power, thunder, and gallop. The final part of the triumvirate is Dexter's generally melodic and clean vocals, backed up often band gang vocal arrangements. The result is bombastic,roaring, and rather epic sounding melodic power metal, and all down without synths (as far as I could hear). As for the songs, for the most part each one puts the aforementioned elements into every arrangement and then races from the gates. There are some nuances here and there. One is the rather benign and quiet start in the first half of Metal For The Light, yet this turns to bombastic power metal for the latter half, before ending with an acoustic guitar outro. Shortly after the mid-point of self-gratifying tune We Are Dexter Ward, there's a nice breakdown of subtle guitar over rippling drum and bass work. But that's the say that the bass and drum work are quite present throughout, thanks not in the least to good mixing and mastering. The most curious song here is the cover of Ballad Of The Green Berets. If you're not an American and not familiar with our Vietnam War, you may not recognize this song. It was written by Robin Moore and Staff Sgt. Barry Sadler, a Viet Nam war veteran, who recorded it has a single. Later it was popularized in a choral version in the John Wayne film, The Green Berets, based on Moore's book of the same name. All that to say this, Dexter Ward to a power metal version of the song, and you can barely pick up the melody. You'll have to listen the original version and then Dexter Ward's version to catch the musical theme. Bottom line: Dexter Ward's Rendezvous With Destiny is solid and entertaining "keep it true" melodic heavy power metal. If that's your thing, you will not be disappointed in the least. Recommended. 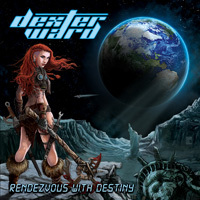 Dexter Ward's Rendezvous With Destiny is solid and entertaining "keep it true" melodic heavy power metal. If that's your thing, you will not be disappointed in the least. Recommended.